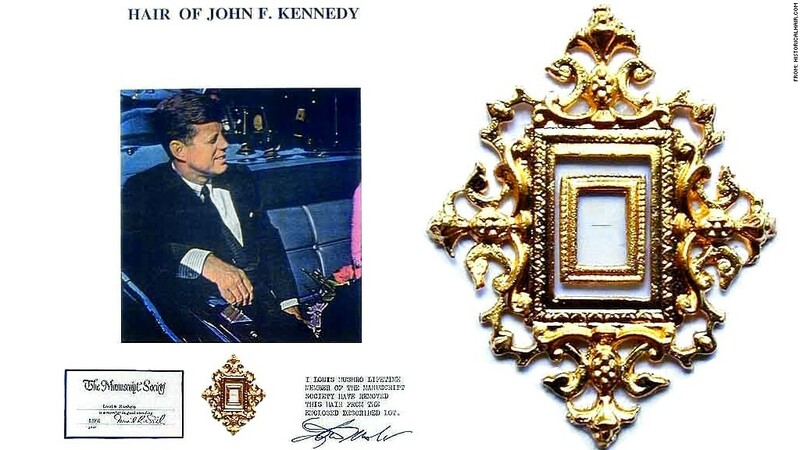 A fraction of an inch of President John F. Kennedy's hair goes for $1,000 on Louis Mushro's online auction site. A lock of Mick Jagger's hair is up for auction, and is expected to fetch at least $2,000. But Louis Mushro doesn't care. He's got more important, and more expensive, hair to worry about. Mushro's sold 4,500 locks from famous people -- from John F. Kennedy to John Lennon -- at online auctions for over 20 years. He's also amassed a venerable collection of hair from the who's who of history, Hollywood and Washington. "Everyone who is interested in anyone who is great would want to have something so precious," he said. For celebrity, sports and music fans, Mushro sells strands from Elizabeth Taylor, Mozart, Mickey Mantle, Elvis, Marilyn Monroe and Joe DiMaggio. Babe Ruth's hair sells for $1,000, and Mother Teresa's $400. History buffs have 40 locks from nine presidents to choose from, including George Washington, Dwight Eisenhower and Richard Nixon. They go for $400 to $4,000 for fractions of an inch of hair. His most prized possession is Abraham Lincoln's hair, for which he paid "a lot of money." Already, Mushro has sold several 1/16th of an inch pieces of Lincoln's hair for about $1,200 each, and he has more to sell. "(After Lincoln's assassination), a doctor opened up the wound area, cut the bloody hair and gave it to Mary Lincoln," he said. "It's something of a beauty, like a horse's mane." One of the rarest strands in Mushro's collection is 1/32nd of an inch of Michael Jackson's hair, which was burned off when it caught fire while filming a Pepsi commercial in the 1980s. The director who filmed the ad sold it for $100,000. Mushro's portion comes in a gold frame with 30 pages of authenticating documents and an account of the fire. He hadn't even heard about Jagger's hair, which British auction house Bonhams will sell on July 3. He's not clamoring for it because he's not sure of its authenticity. Since 1992, Mushro, a manuscript and letter collector, has been in the famous hair auction game. His collection primarily comes from Sotheby's, Christie's, celebrities' homes and barbers. He keeps the hair locked away in a safe. Over the years, he's sifted through the manes of First Ladies, Hall of Famers and queens, but one coveted lock has eluded him. For years he's been searching for a lock of hair from the Civil War officer George Custer. Mushro said it goes for about $50,000 and it's the toughest one of all to find. "I have a part of people, who are famous," he said. "None of that fame ever rubbed off on me, though."